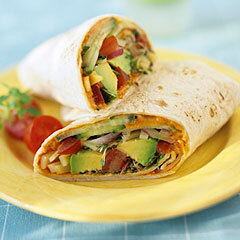 Here's another quick lunch time meal that will take you 5 minutes to prepare and tastes delicious. Spread fat free cottage cheese thinly over the tortilla. Place all your ingredients in the middle of the tortilla. Crumble the feta over the contents. Now drizzle balsamic vinegar. Roll the wrap neatly and cover with cling wrap.